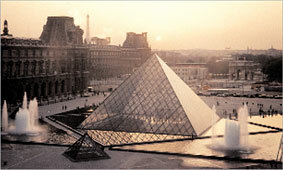 In 1985 P+K were hired as the 'concepteurs principals' for the Musee du Louvre's Visitor Information System. The project was done for and with Ken Carbone of CSA, and I.M. Pei. 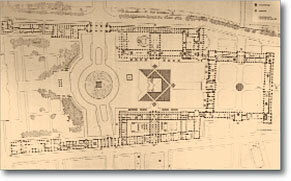 Pei's pyramid gave the Louvre a 'front door', with centralized access to the museum's three wings. The wayfinding solution begins inside the Pyramid. Non-french-speaking visitors in search of the Mona Lisa can relate her image to the name 'Denon', then choose the stairway of the same name. Visitors receive a printed guide with their ticket that divides the museum into 10 neighborhoods, similar to the 'arrondissement' organization of Paris. Within the palace, small signs mark the boundaries between neighborhoods, and replace complicated directional signs that might compete with the art. The neighborhood map is then repeated at key intersections and stairways for reorientation.